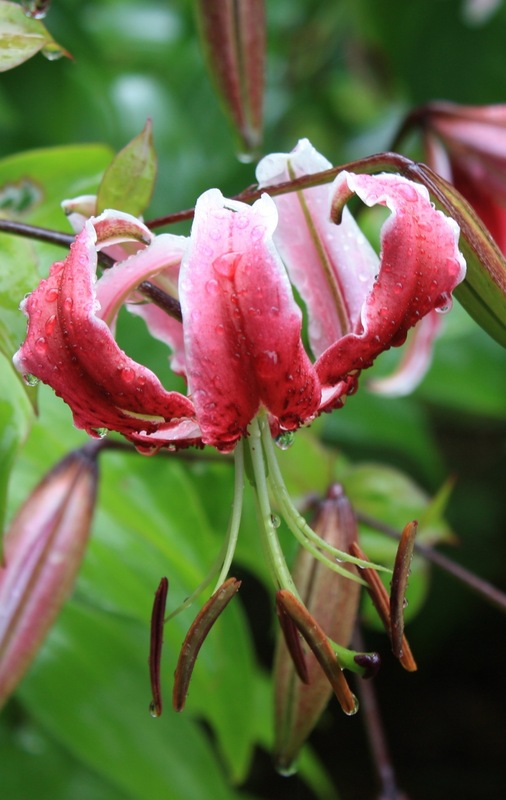 This graceful lily, Lilium speciosum ‘Rubrum’ is one of the last lilies to flower each summer. It blooms profusely, its bold burgundy-red speckled petals curling back on themselves as the buds open. Like other lily species, the flowers’ fragrance is unmistakable and intoxicating. L. speciosum ‘Rubrum’ dislikes our chalky soil, so it’s essential to grow them either in acid soil or in pots filled with ericaceous compost. Pictured here after rain at The Garden House, Buckland Monachorum, Devon. One of my favourites but it doesn’t like my garden soil either.